OR MORE DAMNED LIES FROM THE LUNATIC FRINGE. This post is a follow-up on my very first blog posting regarding the snow extent. The reason why I’ve decided to move this forward, is because of the many misconceptions about what is occurring, what did occur and what never happened. Recently, an e-mail came to light about one person’s belief about the rising sea-level. I don’t know if this was meant for public consumption or not, but its out there now, so no use pretending it didn’t happen. You can read about it here. There is a common thought in the scientific world is the hydrological budget is fairly fixed. That is to say, we don’t gain or lose the total amount of water, but rather it takes various forms. A decent general read can be found here. Briefly about why sea-level is tricky……… many of us consider sea-level like a tub full of water, uniformly rising as it fills. It doesn’t work that way. It raises in some places and lowers in others, a good illustration of this dynamic can be seen here. I won’t get into my thoughts about the whys and wherefores about this dynamic, but for our purposes, we can just accept this occurs. Worse news about sea-level, there are a multitude of data sets and a myriad of different recording devices. There is no uniformity when discussing sea-level rise, so when someone asserts they know what the rate of rise is, call them on it. It isn’t possible to reach that level of certitude. Here’s what most people generally agree upon. In a warmer world, we should expect higher sea levels. And, in spite of the team’s best efforts to disappear the MWP and LIA, we can see that they did occur and it wasn’t localized to Greenland or NW Europe. So, coming out of a LIA, we see a modest rise in sea-levels. I may post on the evidence for that MWP and LIA on a later date. So, what’s this got to do with snow extent? One of the causes of sea-level rise in a warmer world would be moving the H2O from solid(snow and ice) to liquid(water), thus causing sea-level rise. Lately, we’ve had it drilled into our brain that the snow extent is rapidly declining. We earlier showed that the declining snow extent in spring wasn’t very dramatic, but, that’s where it got left. 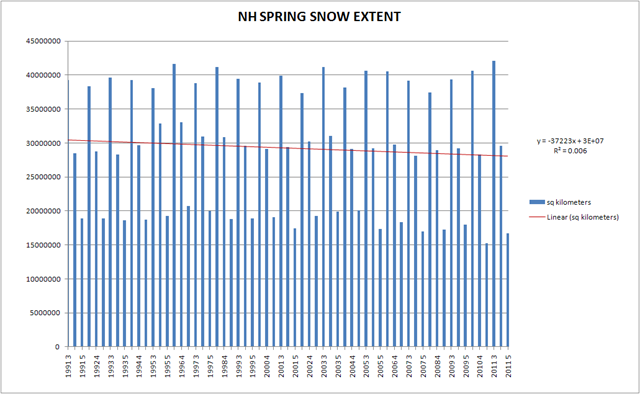 Today, I’ve decided to investigate further as to whether we’re losing snow extent or not………..
First, let’s update the spring snow extent graph, because we’ve got another years worth of data. Here it is over the last twenty years. No, not very scary, still. Now, I know this won’t alleviate the fear of the next impending water world, so I’ll dig a bit deeper. 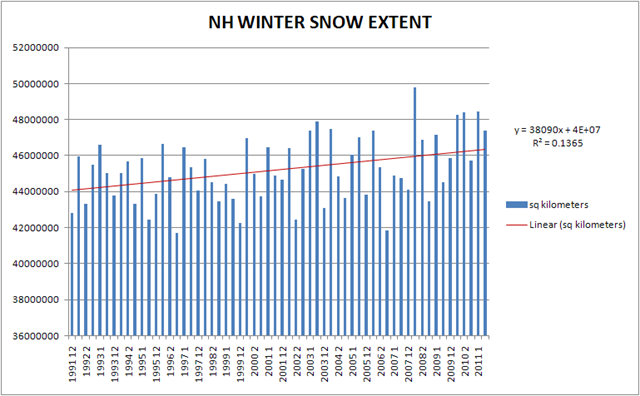 We can trot out a graphic Steve Goddard likes, (only we’ll do it over the last 20 years) the NH Winter Snow extent. Here, we see a much more dramatic slope………… in the opposite direction!!! But that doesn’t give us a full picture. If the snow is melting and we’re getting more in the winter than we are decreasing in spring, then fall should be losing snow also……. Hmmm…….. err….. WUWT? Fall is increasing in snow extent, too! 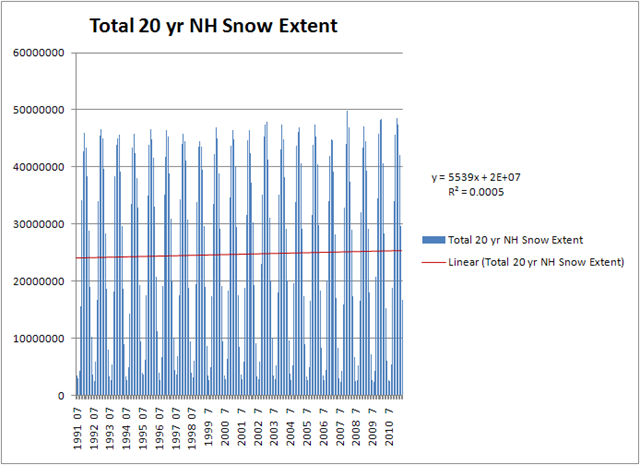 Okay, so for the finale, let’s look at the total Fall, Winter, and Spring NH snow extent for the last twenty years. Oh, turns out we’re not really losing our snow extent. What does this tell us? …….not much really. Except, we know what isn’t happening. 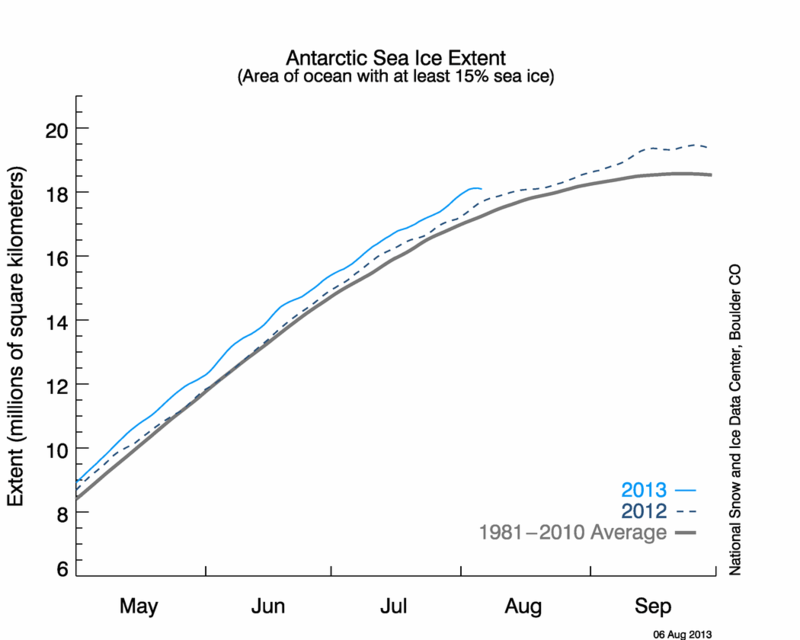 We’re not losing our snow extent and the loss of snow extent isn’t causing sea-level rise. (At least in the Northern Hemisphere) Any claim otherwise is simply a fabrication. 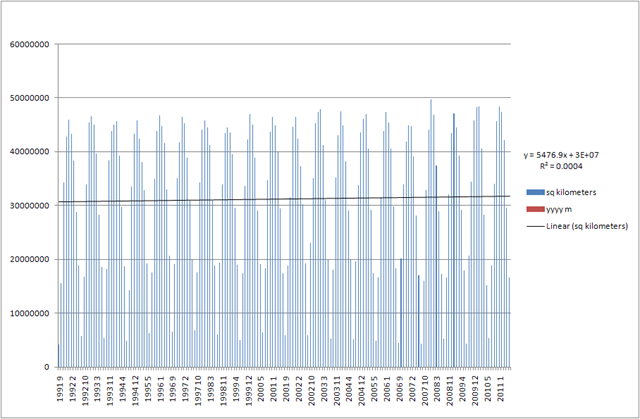 As an afterthought, for you non-believers…..(you know who you are) here’s the entire 20 year monthly history and trend. 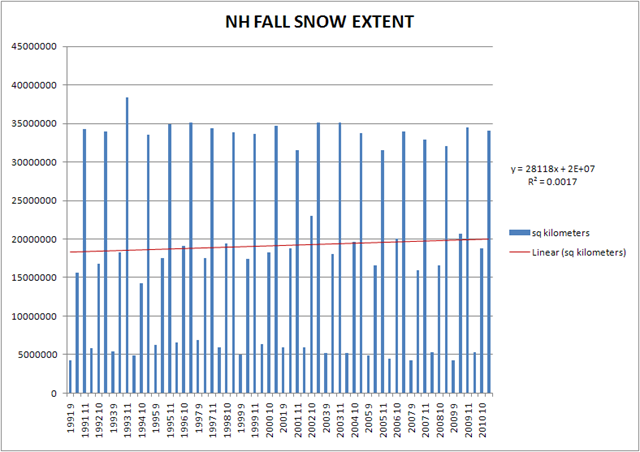 Now, can we dispense with the fallacy of our declining snow extent? It did decline, just not in the last 20 years. Some caveats, explanations, and answers to questions posed. First, I only used Fall, Winter, and Spring because these are the graphics GSL uses and I wished to stay within that particular convention, and I’m not sure what Summer extent would mean, except that I’d be very concerned about a rapidly increasing snow extent during the summer. My seasonal delineations were as follows: Fall, I used Sep, Oct. Nov, Winter, Dec, Jan, Feb, Spring, March, April, May. This may be different from GSL’s. GSL, my source, is RUTGERS UNIVERSITY :: CLIMATE LAB :: GLOBAL SNOW LAB The data may be found here. All values are in square kilometers. Dates are in the format of yyyy mm. I used MS Excel to generate the graphs. I only used NH data because I haven’t found any reliable SH data. Perhaps someone knows of some place where we can get our hands on SH data and would leave us link? Lastly, I’m suppose to have internet hooked up at my house tomorrow. I’ll be a bit more responsive than I have been lately. Thanks for reading. Feel free to make comments, questions, and critiques. Hmm, I thought for sure someone would comment on this information. But not. So, I’ll add a bit. Quite obviously, the missing information is of the SH snow extent. But, I find it interesting that the Antarctic ice extent hasn’t moved much, certainly not, (percentage wise) nearly as much as the Arctic. Now, I’ve always thought there was a certain “ying/yang” with the NH/SH relationship. 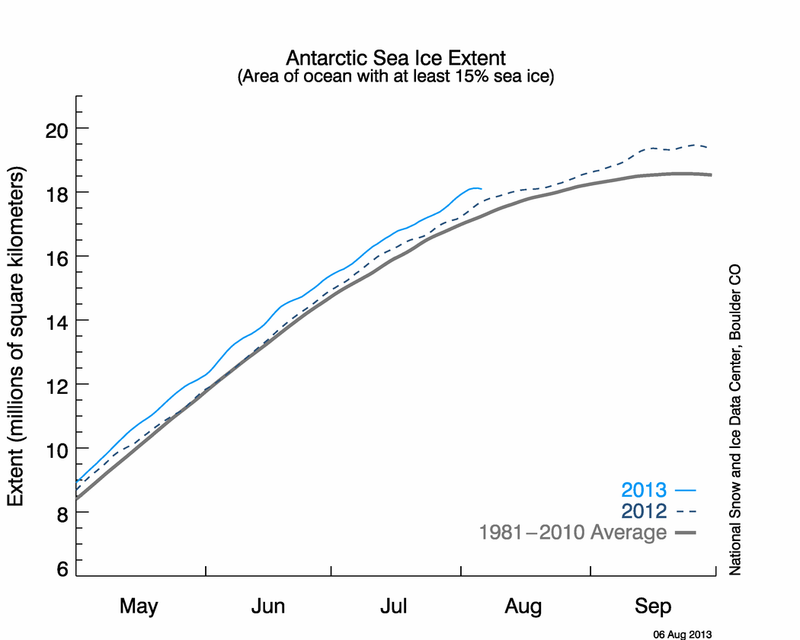 That is to say, if the arctic loses ice, the antarctic would gain and visa versa. That’s pretty much held, but so too would snow extent, temps, precipitation, etc….. So, I’m wondering about the SH snow extent, if it is increasing as the NH, I believe we’re in for some cold climate for a bit, if not, then I think we’ve hit a semi-static state, as close as our climate can get. I just found your link to the site. What you are showing is evidence of long term weather patterns that are not predictable. 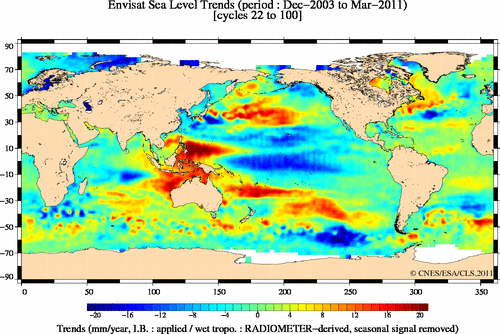 I have read a theory about a 57 or so year cycle of global sea level. That was a theory held in the 1800s. Year to year variation in sea level don’t mean squat and we will not have enough semi-accurate information for another 200 years to have an idea about what the sea level might possibly have done during that time. One of the major problem in error in the equipment and processing methods that rules out a degree of accuracy greater than a foot if even that. This can be seen in the different results given by the Jason satellites and the ESA satellite. Given the differences in quality of measurements over the last 200 years there are no reliable guesses of what the sea level has done during that time. Your theory about Yen /Yang of NH / SH can be seen in some climate reconstructions and using the”Proper” smoothing Al-Gore-Rythm you could end up with the results of Mann Made climate change over any period you wanted. You could even take regions of the east coast and west coast and properly smoothed you could find alarming results or no trend. GIGO can be so much fun!!!! 8). I will book mark this and visit from time to time! Thanks Mike, I’m thinking of putting up a post again. I’m not really using this site as a blog in the sense of Steve’s I think it would be redundant. I started doing this mainly because woodfortrees took a hiatus. I wrote him and he linked back to current data sets……. I’m not sure what I’ll end up doing with it, but be sure and stop back by. I’ll put up more interesting graphics from time to time. All of course will be properly sourced for ease of verification. David, I’m not sure exactly what you’d like me to comment about, so I’ll just say that all of the glaciers throughout the world are in constant movement. Some are growing while others recede. Regarding Glacier NP specifically, these are remnants of the last ice age. While glaciers are fascinating, in general I believe we’re better off without these moving mountains of ice than we are with them. Land use in the surrounding areas of glaciers seem to have a large impact on various glaciers. The abnormal condition is that there are glaciers at GNP. The more glacier build the less water available for use and to recharge the water tables. Without glaciers the water could be stored better in reservoirs or used as it runs to the oceans. Retreating glaciers are not a problem. Advancing glaciers are as they “WILL” wipe out every thing in their path. Look at a moraine pile and you will see the glaciers even scour the rock causing it to erode faster. Yosemite is a good example of a glacial valley and there are others. The great Lakes were formed by glacial advances! Think of Chicago under more than a mile of ice! Columbia River basin was formed when a glacial lake washed through the ice dam that held it back. Less ice equals more biodiversity! David, the land on which my home rests was once under a continental glacier a mile thick. I for one am glad the damn thing melted. Yosemite Valley was once under a glacier and again, I’m glad the damn thing melted. And no human had anything to do with either of these massive glacial retreats.